A widely known interesting fact about the occurrence of Diabetes is that 90% diabetics of the world suffer from Type 2 Diabetes. Moreover above 285 million people suffered Diabetes. Isn’t this enough to qualify Type2 Diabetes as the epidemic of present time? Well Type 2 Diabetes is more of a condition than a disease. It’s a condition which leads to severe diseases if left uncontrolled. Basically Type 2 Diabetes is chronic and non curable but definitely controllable. Insulin-dependent Diabetes and Adult-onset Diabetes. A person having Diabetes Type 2 has increased blood sugar levels because of inability of Insulin to work because the fat, liver and muscle cells reject to respond to Insulin. When these cells resist Insulin action, glucose can’t get converted into energy and such cells do not get energy. The excess sugar unutilized by cells goes to blood increasing the level of sugar in blood. Why do so many people get Diabetes Type 2? The most probable reason behind millions of people stuck with Type 2 Diabetes might be the inactive lifestyle-lesser labor, eating and sitting. Another reason maybe that when people with genetic disorder of improper Insulin processing, reproduce, their generations inherit this trait. This inheritance accounts for increased occurrences of Type 2 Diabetes. 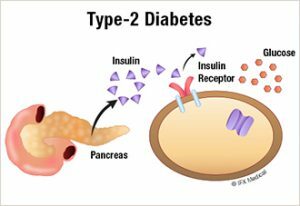 In rare cases Type 2 Diabetes can be a result of alcoholism that causes damage to pancreas. Which symptoms show up indicating Diabetes Type 2? The basic symptoms would be slow healing of wounds and infections, blurred vision, increased fatigue, pain in hands and feet, frequent urination, increased thirst and increased hunger and/or erectile dysfunction. Knowing these symptoms help self evaluation of changes in body and indicate the dire need to report them to a medical practitioner as soon as possible. Know your Diabetes well; equip yourself and your family about unexpected conditions that might come up and how to progress in that case. Never choose the extremes- eating very much or fasting, rigorous exercising or being a couch potato and skipping medicines or taking higher doses than prescribed. Avoid any irregularities in routine. Be extremely careful to problems such as dehydration, increased blood pressure, considerable change in mood, any foot injury, chest pain, fainting, etc. With a diabetic, such situations are alarming. Seek medical advice immediately. Eventually Diabetes Type 2 can give birth to very acute problems. During the later years of Diabetes it may cause cardiac arrest, stroke, numbness, kidney damage, infections building up in feet that can be severe to an extent that needs permanent removal of leg, blindness, eye problems, genital and skin infections. Such situations need to be avoided by consulting Doctor regularly at least 4 times a year and having regular checkups for kidney and heart health. Further the children of diabetics should prevent Diabetes Type 2 by maintaining a healthy body weight and a healthy lifestyle including exercising. Diabetics are commonly prescribed Actos, a.k.a. Pioglitazone. If you or a loved one has ever been prescribed Pioglitazone, please contact a doctor immediately to discuss potentially fatal side effects including bone fracture, bladder cancer, and heart failure.